Computer Country has a repair workbench staffed by experienced technicians. Take advantage of Computer Country’s Network Service Team to get your network under control, secure and stable. Computer Country & Networks excels at providing Post Server Installation and Upgrade support. We offer 24 x 7 support, Managed Service Options and Monitoring. Whether you’re operating a fine dining restaurant, a quick service chain or even a high volume bar, expect to increase your performance with PixelPoint POS software. Computer Country has a repair workbench staffed by experienced technicians with the tools and expertise. From component replacements, upgrades and repairs to software backups, we do it all. For 35 years Computer Country & Networks has been providing comprehensive technology solutions to businesses of all sizes throughout the Stratford, St. Marys and Mitchell Ontario Canada surrounding areas. Thinking of buying a Server for your growing business? Do you need help with your existing Servers? Expansion, Upgrade, Replacement, Virtualization? Computer Country & Networks can help! Bring your computer in and let one of our friendly and professional computer technicians fix your computer. We welcome all makes and models. We talk your talk, speak your speak and treat you with respect, something that is lacking we are told with other local service providers. Is your computer slow? Is your PC not responding? You could have a computer virus. We offer SPYWARE removal and computer VIRUS removal services. We offer full computer tune-ups. Let us speed up that old computer and make it secure. We service computers needing repair in Stratford, Mitchell, St. Marys, and surrounding areas. Rest assured, if you computer is not worth fixing, we’ll tell you and let you decide a course of action with our Free Advice guiding you along. If you are unable to come to us, Computer Country & Networks will send a professional computer repair technician to fix the problem in your office. Services are available in Stratford & surrounding areas from Goderich to Cambridge to London Ontario. 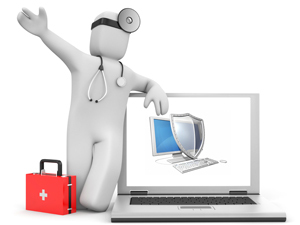 Services Include; computer re-format, windows recovery, virus removal, spyware removal. Hardware upgrade (motherboard – memory – hard drive – video card), network setup and support, home wireless installation and security, windows password recovery, BIOS password recovery, data recovery, software installation and more…. With Industry certified technicians and 24/7 business customer support we are able to help business and small offices like yours with Total Computer Service and Repair Care. Providing Computer Service & Repair For All Your PC Problems in Stratford & Surrounding Area. Unused program, temporary and junk file cleanup. Hard drive & memory upgrades, data transfer. Picture backups to external media.